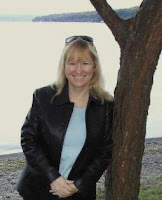 Nancy Holzner is my guest today. I know it is shallow of me, but I knew very early on that I wanted to read Deadtown and have her as a guest. When precisely? Well of course it was as soon as I saw the awesome cover that was designed for the book. When the book was finally released, it turned out to be a delightful adventure romp that fully lived up to my original impression. Because I want to share the fun, I have a copy of Deadtown to giveaway to one lucky commenter. Details at the end of the post. Nancy will drop by to answer your questions, so say hello or take the opportunity to ask an urban fantasy pro about their secrets. Careful though, because I suspect Nancy has some gear similar to what Vicky is wearing on the book cover. Just before we ease into the interview here is the synopsis of the book to set the stage. SFG: The cover blurb does an excellent job of describing the book. Are there additional details or highlights you would like to add to it for new readers? I agree with you that the back cover copy does a great job—better than I could—of succinctly conveying the action and complexity Deadtown’s plot. The only thing I might bring out more is the political context in which the story takes place: the attempts of human society to control paranormals through law and the hodgepodge of those laws throughout the country. A lot of readers have responded to that aspect of the story. SFG: Hopefully you won’t consider it spoilerish - could you tell us about the meaning behind the title Deadtown? Three years before Deadtown’s events take place, a fast-acting plague struck downtown Boston, killing about two thousand humans. The area where the plague struck became a quarantine zone—and when the plague victims came back to life, the quarantine zone became the enforced home of all of Boston’s paranormal creatures. The “Deadtown” nickname came about when there were a couple thousand corpses littering the plague zone. SFG: You use Welsh legends for the shapeshifters in Deadtown. What led you in that direction? I’ve always enjoyed reading medieval literature, and I started my career as a medievalist. I used to teach a popular course on Arthurian Literature, and in that class we’d look at some Welsh stories of King Arthur and his knights, such as “Culhwch and Olwen” from the Mabinogi. Although it’s not Arthurian, the story of Ceridwen and Gwion Bach, which is really the origin story of the great Welsh bard Taliesin, was one of my favorites. It’s got a magic potion, a burst cauldron, and a shapeshifting contest. (You can read a 19th-century translation here.) I thought the story would be a fun basis for a race of shapeshifters. SFG: Deadtown has only been out a few weeks and is generating a lot of positive buzz. What do you think of the reaction and how does it compare to your hopes for the book? In contrast, Deadtown has gotten a good amount of attention. It makes me very happy to hear that people have enjoyed the book. My publicist and Ace and I both worked hard to get the book in the hands of reviewers, plus I’m making the effort to get out and talk about the book—on blogs and on social networking sites. That could be a full-time job all by itself. Some readers have let me know they enjoyed the book and recommended it to friends, so I think there’s been good word of mouth, too. Of course, I hope the book does well. It was a lot of fun to write, and I hope that the interest will be there to extend the series for more books. SFG: You have said elsewhere that you read a lot of urban fantasy. How were you introduced to the genre and what is it that you like best about it? A friend recommended Kim Harrison at about the same time another friend discovered Laurell K. Hamilton’s Anita Blake series and blasted through the first three or four books in a week. Both were raving about how much fun the books were. I had to check them out myself and got similarly hooked. What I enjoy most about urban fantasy is the sheer imagination of the genre. I love stories that keep me on the edge of my seat because anything can happen. Urban fantasy authors excel at creating worlds that have their own rules but stretch the boundaries of ordinary reality. I like the way that urban fantasy worlds are simultaneously very familiar and utterly strange. SFG: Because inquiring minds want to know, what are the long term plans for the series and what other projects do you have percolating for when time permits? Deadtown’s sequel (which doesn’t yet have a final title) is with my editor now and will be out in a year. I’m currently working on proposals for three more books in the series beyond that. As I mentioned earlier, I love these characters and want to see how their stories unfold. The story arc brings in more elements of Welsh mythology, the stakes get higher, and the relationships get both deeper and more complex as the series proceeds. Lately I’ve been toying with an idea for a contemporary fantasy set in the Catskill Mountains. The Catskills are home to Rip van Winkle and the Headless Horseman, Native American legends, and ghost stories brought over from the Netherlands and England. Plus the landscape is both beautiful and dangerous. I think the area would be an awesome setting for a fantasy. SFG: There seems to be a trend for urban fantasy authors to eventually write young adult novels as well. Is this something you would consider? Do you read YA in the genre and if so do you have any personal favourites? I do read some YA, although my tastes run more to adult novels. That said, I’m a big fan of YA literature in another sense. I taught high school English for a few years, and I’m very much in favor of novels that engage teenage readers and generate enthusiasm for reading. Sometimes I think that school curricula push the classics on young readers before many of them are ready to engage with those texts—and some students find the books boring as a result. When I taught at universities, time and again I’d add a text to my syllabus—Beowulf is an example—and students would object, “But we already read that in high school!” And I’d have to say, “Not like you’re going to read it with me.” But it was an uphill battle. Students had slogged through Beowulf once and hadn’t liked it. They felt like they should be able to check it off their list, and there was tremendous resistance to reading it again. Sometimes I managed to open up new understandings of the text, sometimes not. But if some of those students had been given more choice in what they could read in high school, I think they would have been more open to reading Beowulf and other classic texts in college. 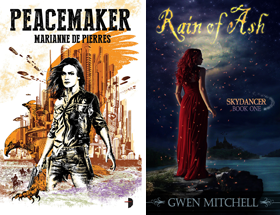 So I’ve been happy to see so much really high-quality YA fantasy being published lately. I’m thinking of books like The Forest of Hands and Teeth, The Hunger Games, Graceling—well written, exciting books. I don’t have plans to write YA myself in the immediate future, but it’s exciting to see what’s out there. SFG: By now you must have been asked a lot of the same questions. What is the one new question you wished you had been asked and what would your answer be? Nobody ever asks me about my playlist—which might have something to do with the fact that I’m a fanatical opera lover. But the truth is that I prefer a quiet environment for writing. Silence is ideal. I often write in coffee shops, though, so I’ve gotten good at tuning out background conversations and whatever’s playing over the PA system. But I can’t listen to music I like as I write—the music grabs my attention and makes it hard to immerse myself in the world of my story. SFG: If you could be any supernatural character what would you be and why? Um, let’s see. I’d make a lousy vampire, because I’m one of those people who gets queasy at the sight of blood. I think I’d like to be a shapeshifter along the same lines as Vicky—I like the way her race, the Cerddorion, can change into any creature and can shift at will up to three times per lunar cycle. However, if I were Cerddorion, my shapeshifting days would be over because females lose their ability to shift when they give birth. And I wouldn’t trade my daughter for anything. SFG: If you could have lunch and conversation with any author, dead or alive, who would it be and why? I think it would be fascinating to sit down and have a conversation with J.R.R. Tolkien. Apart from being the author of the most influential fantasy novels of the 20th century, he was a medievalist who specialized in Old English language and literature. I’d love to have a conversation that ranged from Anglo-Saxon poetry to modern fantasy. Plus I understand Tolkien liked good beer, so we could have lunch in the pub he used to frequent in Oxford. SFG: Being the SciFiGuy I have to ask, what is your favourite science fiction book and movie? I like a lot of classic science fiction: Asimov’s I, Robot; Delany’s Dahlgren; Bradbury’s Fahrenheit 451 and The Martian Chronicles. (I’m a sucker for a good dystopian story.) For movies, some of my favorites have been Blade Runner, The Matrix (just the first one—I didn’t like the second and never saw the third). Last year I really enjoyed J.J. Abrams’s Star Trek film. I have one copy of Deadtown to send to someone in anytown. Leave a question or comment for Nancy. Open anywhere that The Book Depository ships. Giveaway open until Midnight, January 18, 2010 EST. Winner will be selected by the Randomizer. Nancy, your book sounds extremely interesting. I work for a large bookstore chain in Canada and I am always looking for new authors to recommend to my regular customers. Deadtown sounds like it would suit myself and a couple of my regulars. I will look for it when I go to work tomorrow. Great interview. Great interview, and with you on who you want to meet. The book sounds great, and I love the lore behind it. Liked the sounds of that story you are toying with too. So we could expect some ghosts running around in the Catskills or? As a medievalist have you ever considered doing a so called "high" fantasy novel like George RR Martin or Steven Erikson ? The Welsh aspect might ebanble you to do something new. @Lynette: Thanks for taking a look at Deadtown. I had a blast writing it, and I think it's a fun story. I hope you'll enjoy it. @ Blodeuedd: Yeah, it'd be fun to have a beer with Tolkien, wouldn't it? Or to sit in on a meeting of the Inklings. Just a fly-on-the-wall role would be cool. @buddyt: I haven't attempted any high fantasy. I love to read the genre but to be honest it intimidates me a little. Also, I'm interested in stories that bring about a confrontation between modern and medieval ways of seeing the world. I think urban fantasy offers great possibilities for doing that. Hey Nancy, the book sounds great (I am a horrible person & have yet to pick a copy up!) Do you write to music? If so what's your favorite to write too? Posted about this on my site. @elaing8: Thanks! I've been really happy with most of the reviews I've seen. I could breathe again after that nerve-wracking period when you aren't sure whether people will like it. @Natasha: I have real trouble writing to any music that has singing. The words, or even just the voices, distract me. So sometimes I'll listen to classical music or music that's designed for meditation as I write. Thanks for the great interview Doug. Congratulations Nancy. Wishing you continued success. How did you go about picking Vicky's name? I've had Deadtown in my wishlist for a while now. Please count me in. Thank you for the interview and taking time to chat with us. Congratulations on the new release. I've definitely added this to my wish list. Is the same artist going to do the cover art for the sequel or is it too soon to know that? @Jen D: In the book, Vicky explains how her father dreamed about her name before she was born: "A girl child shall be born unto you, and her name shall be Victory." That sentence came to me very early in the process of thinking about the character. So I had a first name. At that point, I was still researching various mythologies and their demons. When I decided to use the Mabinogi, I started looking for Welsh surnames. Vaughn just clicked. Deadtown sounds great. I've seen so many positive comments about it on various blogs. Congratulations on capturing everyone's interest! Thanks for visiting today. Why the werewolf? Is that just to make it appear more to urban fantasy people (because, honestly, it doesn't sound all that urban fantasy-ish - even though it does sound pretty awesome). The books sounds interesting. What made you pick Boston as the setting? It's one of my favorite cities to visit. The books sounds great...random question..Who is your all time favorite vampire? Sounds like a cool book! And the cover's edgy. Thank you (as always) for the great interview. I am excited to get my hands on it. I'm also glad to hear that Nancy would love to meet with Tolkien. That man must have one interesting brain and I too would love to sit down for a chat with him! @Nels: It's funny how urban fantasy is one of those genres that raises different expectations in different readers. I do think of Deadtown as falling squarely into the UF category because of its contemporary urban setting, its cast of paranormal characters, & its protagonist, who's both a shapeshifter and a demon slayer. Kane's a werewolf partly because I thought it would be interesting to contrast his kind of shapeshifting with Vicky's. @Anonymous: I love Boston, too. I went to college there and lived in or near the city for several years beyond that. I liked imagining how Bostonians would cope with the sudden appearance of "monsters" in their midst. @angeleyesak: The random questions are the hard ones LOL. There are so many good ones! Dracula is the classic (and I'm big on classics), but I'll admit that lately I'm rather partial to Bones in Jeaniene Frost's Night Huntress series. @throuthehaze: Glad you enjoyed the interview. And I hope you'll like Deadtown when you get a chance to read it. 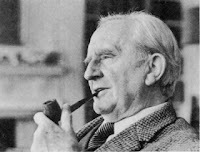 @Michelle: I thought of a lot of potential lunch partners, but Tolkien seemed most intriguing. I love the look and sound of the book and wonder if you have any movie aspirations for it? I think it could translate to the big screen very well. I bought DEADTOWN last week, and I'm very much looking forward to reading it! You got an awesome cover, and I LOVE urban fantasy! We seem to have similar tastes with the UF, and I loved the YA books you mentioned, as well as the SF/F novels you said were favorites, so I was wondering if you have a favorite book from 2009? Or a favorite of any books you've read recently? Hi, Nancy. I look forward in reading your book. @BarbP: Thanks so much! I hope you'll like the book. @heatwave16: Funny we took the same route into reading UF. That would be harder to do now, I think, with the proliferation of great authors in the genre. @booklover0226: I didn't make a book trailer for Deadtown, so I can't speak to that from my own experience. But I do think a well made book trailer can generate interest in a book. Thanks again to Doug for hosting me here! Great interview and the book sounds exciting. I spent a lot of time in the Catskills growing up, and I'm intrigued by the idea of a fantasy series set there, I hope you go forward with that idea. I really enjoyed this interview. I have to admit when I first saw the book I didn't know if I wanted it. But with more detail I learn of the book I have started to need to read it. I really liked the idea of using the Welsh legends as the basis for shapeshifters. Now after reading this interview I will have to have this book. Thank you for a chance to win this one. Hi Nancy! This book looks like it's got a lot going on (in a good way!) to keep the reader's attention. I've been reading great reviews and am looking forward to reading this. Hi Nancy, I've heard a lot of this book, and I can't wait to read it. Are you zombies the way classic zombies are or is there anything special about them? it's great to see you here - you are a new author to me and the interview is very interesting... especially the background news to Deadtown - I like this kind of facts! I really enjoyed reading this interview and I got even more curious about your book. I'll read it as soon as I can. Hi Nancy, Deadtown sounds like an awesome read and I've seen a lot of great blog action about it. I really like the contempory fantasy idea set in the Catskills - especially if it evolves around Native American culture or folklore. I've always been facinated by the Wendigo legends. This book looks great. I love the cover. Nancy, I love the cover of your book and I've seen some great reviews for it as well. I had already added it to my wish list before I read this interview and I'm even more interested now, especially upon learning more about the lore behind it. Congrats on your release Nancy, I've been hearing awesome things about your book and I'm very eager to get my hands on it, it sounds like it kicks some serious arse! Just popping back in to see if there were any more questions. Thanks to everyone who said hello, who enjoyed the interview, and who looks forward to Deadtown! 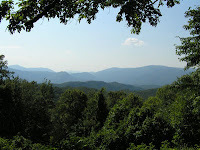 I'm encouraged by those who've said they'd be interested in a Catskills setting for a fantasy. I'm looking forward to sketching out my ideas for that. Spav asked about Deadtown's zombies. They're not conventional horror zombies. They may look somewhat like those, but they're able to think and talk, and they retain their pre-zombie personalities. They were afflicted with a virus that hit downtown Boston. (In later books, we learn more about the zombie plague and why it affected Boston only.) Although their behavior isn't like that of conventional zombies, they do have a little problem with frenzied hunger whenever they catch the scent of human blood. Make social situations a little awkward sometimes. :) To get a sense of what Deadtown's zombies are like, you can read Chapter 1 for free on my website: http://nancyholzner.wordpress.com/books-2/books/chapter-1/ The opening chapter shows Vicky on a job, along with her self-appointed teenage zombie apprentice. this book sounds great and it is definitely on my wishlist. I too would love to sit talk to the hobbit king as my oldest son liked to call him. the idea your playing around with sounds fanastic too. other than Tolkien what 3 other people living, dead, imaginary, or real would you like to sit down to dinner with. I enjoyed the interview very much and I've heard great things about this book. I would love to read it. This looks like I'll have to buy it if I don't win it.. I've heard such great things about this book I'll definitely check it out sooner rather than later! I was wondering if when writing for these characters you already have in mind where you'd like their lives to go in the future novels, or if you just have some ideas floating around and just know you'd like their story to continue? I enjoyed the interview - Deadtown sounds like an fantastic story. I like the unique take on the shapeshifting - makes the decision on motherhood sound like a difficult one. It's interesting that you can't work with music playing. I've found that if it's music that I usually listen to I can tune it out, but if it is not my regular preference, it distracts me and I can't concentrate. Thanks for the interview. This book sounds fascinating to me & I'd love to get the chance to read it. I like to escape into a good sci-fi book once in a while & this one looks like it will do the trick. I'd like a chance to read this. The cover looks great too.